Diabetes is a chronic metabolic disease that affects the way the body converts food into energy. In a healthy person, the food you eat is broken down into glucose, or sugar, and released into the bloodstream. Your pancreas makes a hormone called insulin that lets the blood sugar into your body’s cells for use as energy. If you have diabetes, your body either doesn’t make enough insulin or stops making insulin (Type 1) or your body can’t use insulin properly (Type 2). The blood sugar builds up in your bloodstream, eventually causing serious health problems like heart disease, loss of vision and kidney disease. With Type 1 diabetes, your body mistakenly attacks itself through an autoimmune reaction that prevents your body from making insulin. Type 1 accounts for about 5 percent to 10 percent of all diabetes cases and is usually diagnosed in children, teenagers and young adults. People who have Type 1 diabetes must take insulin every day to survive. There’s currently no known way to prevent Type 1. People with Type 2 diabetes are unable to keep their blood sugar at normal levels because their bodies don’t use insulin properly. It’s the most common type of diabetes, accounting for 9 in 10 cases. If you have Type 2, you can prevent or delay your diabetes with lifestyle changes such as losing weight if you’re overweight, eating a healthy, balanced diet and regular physical activity. Type 2 diabetes is manageable with medication and/or insulin, depending on the severity of the individual’s diabetes. Pregnant women who have never had diabetes may be at risk for gestational diabetes. This happens when a pregnant woman’s body can’t keep up with insulin production. Lots of hormonal changes are happening during pregnancy, which can cause your body’s cells to become resistant to insulin. About 2 percent to 10 percent of pregnancies in the United States every year are affected by gestational diabetes, which usually goes away after giving birth. If you have gestational diabetes, you’re at higher risk of delivering a very large baby (9 pounds or more), and your baby is at higher risk of early birth, having low blood sugar and developing Type 2 diabetes later in life. Gestational diabetes is managed primarily through a healthy diet and physical activity, though medication may be needed if diet and exercise aren’t enough. More than 1 in 3 adult Americans have prediabetes, in which blood sugar levels are higher than normal but not yet high enough to be considered full-blown diabetes. Ninety percent of people with prediabetes don’t know they have it. People with prediabetes are at higher risk for Type 2 diabetes, heart disease and stroke. Find out if you may have prediabetes here. Eat healthy foods that are low in fat and calories and high in fiber. Focus on fruits, vegetables and whole grains, but remember that fruits and starchy veggies have natural sugars. Try to limit your intake of meat, particularly red meat and processed meat. Aim for 30 to 60 minutes of moderate physical activity most days of the week. Take any medications as needed. Don’t skip a dose. Here are a few numbers from Well-Ahead Louisiana to make you think. Louisiana has the ninth highest rate of diabetes in the United States. In diabetes death rates across the United States, Louisiana ranks seventh highest. The number of Louisiana residents with diabetes – more than 487,000 – is enough to fill Tiger Stadium 4.8 times. We could fill the Superdome 16.6 times with the 1.27 million Louisianans who have diabetes, most of whom have no idea they have it. African Americans are the most likely Louisianans to be affected by diabetes (16.7 percent), followed by Caucasians (11.8 percent), Hispanics (10.4 percent) and others (9.6 percent). People who make less than $15,000 per year are three times more likely to have diabetes than people who make more than $50,000. Two out of three people with diabetes will die from a heart attack or stroke. About 60 percent of people with Type 2 diabetes are obese. Along with regular care from your doctor or other primary care provider, you may want to consider participation in a diabetes prevention program and/or a diabetes self-management and education program. Well-Ahead Louisiana can connect you to these programs. If your prediabetes risk test indicates you are at risk for prediabetes, you may consider joining a National Diabetes Prevention Program. These programs consist of a year of 16 weekly classes followed by six monthly maintenance sessions. For maximum benefits, anyone participating in a program must complete 150 minutes of physical activity weekly and lose approximately 5 percent to 7 percent of their body weight. These programs are evidence-based and effective. You can use the Well-Ahead Louisiana Community Resource Guide to find a National Diabetes Prevention Program near you. If you have been diagnosed with diabetes, there are more than 50 Diabetes Self-Management Education and Support programs available in Louisiana. These programs provide up to 12 hours of diabetes self-management principles. The principles covered include stress management, eating with diabetes, benefits of physical activity and the importance of sticking to prescribed medications. 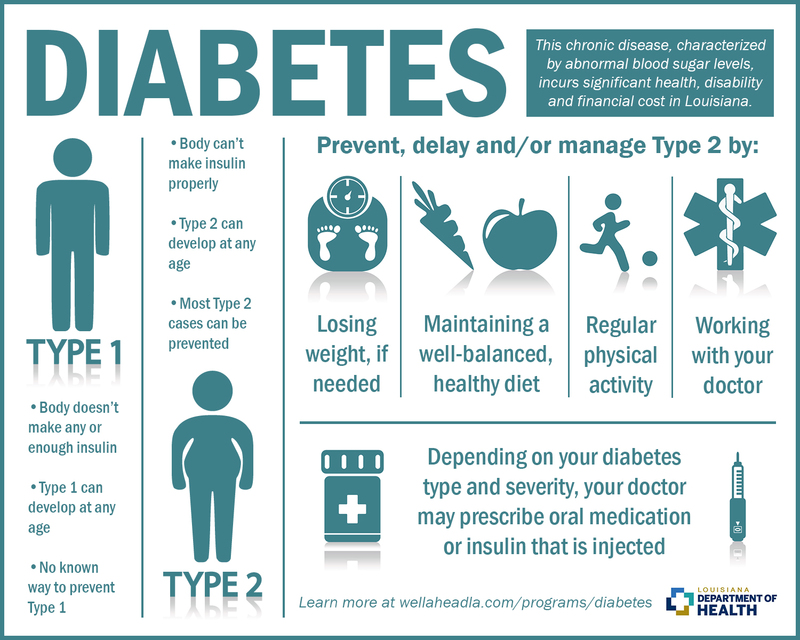 You can also use the Well-Ahead Louisiana Community Resource Guide to find a Diabetes Self-Management Education and Support program near you. The United States Preventive Services Task Force recommends screening all adults ages 40 to 70 who are overweight or obese for abnormal blood glucose as part of their cardiovascular risk assessment. Don’t forget to follow up with your patient to discuss their lab results. If the patient’s blood glucose is elevated and falls within the prediabetes range, refer them to an evidence-based lifestyle change program, such as a National Diabetes Prevention Program. Again, you can use the Well-Ahead Louisiana Community Resource Guide to find a program. 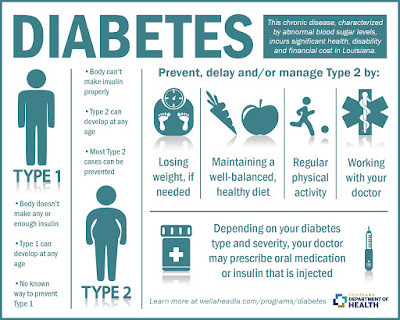 For more information and resources, visit Well-Ahead Louisiana, the American Diabetes Association or the Centers for Disease Control and Prevention.